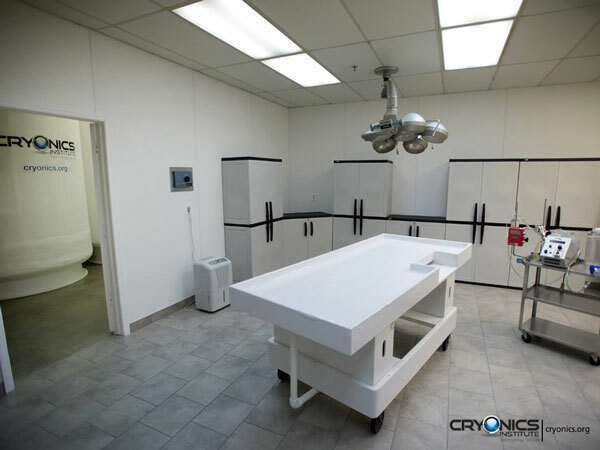 It is most important that the cryonics patient is a CI member and has completed all of the necessary documents with their funding arrangements in place. This will allow CI to accept the patient without hesitation or delay. Time is of the essence for a successful cryopreservation and being prepared before an emergency arises can make all the difference. If a patient is near death, the Cryonics Institute should be notified immediately at 1-586-791-5961 and kept updated of any changes. It is also suggested that, if possible, a cryonics patient relocate themselves to Michigan, near the CI facility, before death occurs. Delay in transfer to the facility can be avoided this way. If this is not an option, it is strongly advised that the CI member, or their next of kin, make arrangements with a local funeral director before the time of need. The funeral director can then be better prepared to act during an emergency. If possible, CI Members should arrange to have a cryonics standby team standing by their bedside when they are in a terminal condition. Such a team can initiate rapid cool-down and provide other helpful stand by procedures. An anticoagulant should be injected to prevent the blood from clotting, which will help to improve the patient’s perfusion. When using the anticoagulant, Heparin, a dose of 30,000 units is given for patients weighing up to 200 lbs. and a dose of 40,000 units is given for patients weighing 200 lbs. or more. Once the heparin is injected, Cardio Pulmonary Support (CPS) (chest compressions) is required for at least 5 minutes to circulate the heparin throughout the body. During transportation from the place of death to the funeral home if the patient dies outside of Michigan, or to the CI facility if the patient dies in Michigan, CPS should be given, if feasible, manually or by machine (thumper or Lucas) in order to minimize deterioration, help cool the patient, and to help distribute the heparin. If the patient can be moved to Michigan near the CI facility before death occurs, this will eliminate transportation delays. Patients living outside of Michigan will require the services of a funeral director near them to cool the patient in ice and arrange for transportation to Michigan. The out of state funeral director will obtain the necessary transit permits and arrange for the patient to be transported to Michigan, by airline or vehicle, whichever is fastest, while keeping the patient in ice. If the patient is flown to Michigan, CI personnel will arrange to have the patient picked up from the Detroit Metro Airport (DTW) and brought back to the CI facility. Upon arrival at CI's facility, the patient’s blood is removed as CryoProtectant Agents (CPAs, substances that prevent ice formation) are introduced to replace the patient's blood and body water, a process known as “Perfusion”. Blood vessels are accessed and cannulated for the perfusion and a licensed funeral director performs the perfusion. The cryoprotectant used by CI is called CI-VM-1, a Vitrification Mixture which was developed by CI's former in-house cryobiologist, Dr. Yuri Pichugin. Vitrification solutions can completely eliminate ice formation. The perfusion with vitrification solution is done at increasing concentrations, until a target concentration of 70% CI-VM-1 is reached. The patient is kept cold through the process, as the lower concentration CPAs are stored and introduced at refrigerator temperature. The 70% CI-VM-1 has been stored in a freezer, so it is below freezing temperature. 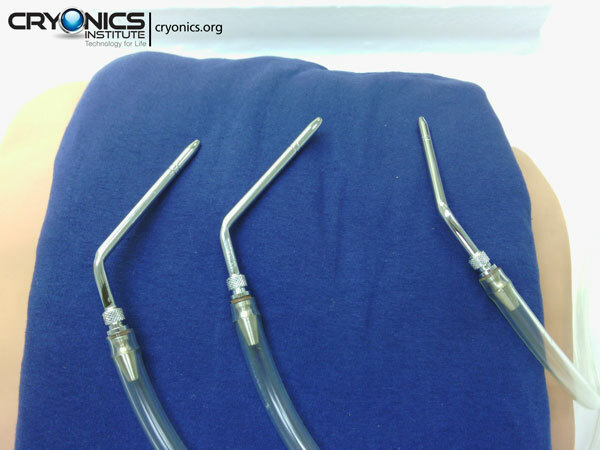 Thermocouples are placed in the nasopharynx for monitoring the patient’s brain core temperature through the perfusion. CI protocol is to perfuse the entire body, by way of the carotid arteries. The funeral director gains access to the blood vessels by small incisions along the clavicle. The right and left carotid arteries are carefully incised for the insertion of the cannulas required for perfusion. Both arteries are cannulated towards the heart and towards the brain to achieve a full body perfusion. To protect the integrity of the vascular system and ensure a successful perfusion, the pressure and speed at which the cryoprotectant is introduced into the patient is monitored very carefully. The right and left jugular veins are also cannulated for drainage and for sampling of the effluent. A refractometer is used to measure the refractive index of the effluent from the jugular veins. Perfusion continues until the refractive index of the effluents is matched with the refractive index of CI-VM-1. Once this is achieved, the perfusion is halted. Perfusion will be halted before the refractive index of CI-VM-1 is reached only if there is considerable edema evident in the patient’s brain. When the perfusion is complete, the incisions are sutured by the funeral director. The patient is then sheathed with a light weight cover for dignity and placed in an insulation pouch before being moved from the operating table to a stretcher where they are secured to a backboard for support. The stretcher is used to transport the patient from the perfusion room to the computer controlled cooling unit, inside the CI facility. The patient is carefully placed in the cooling unit on their backboard. The insulation pouch is opened slightly to allow for consistent cooling. The appropriate program is selected to steadily cool the patient to liquid nitrogen temperature. The process of cooling the patient to -196c takes five and a half days. The cooling is done by CI's computer-controlled cooling unit. The computer-controlled cooling unit constantly monitors the temperature inside the cooling unit via a thermocouple. At the end of the cooling process, the patient is carefully removed from the cooling unit and the insulation pouch is closed. Once ID tags are attached to the patient for identification purposes, the patient is ready to be transferred to the cryostat (long term storage unit). The patient transfer is done quickly, but carefully, while the insulation pouch is saturated with nitrogen, so there is no appreciable warm-up during transfer. The ropes that are attached to the patient’s backboard are secured to an electric lift and the patient is safely lowered into the cryostat. Cryostat liquid nitrogen levels are monitored daily to ensure the safety of the patients. CI staff adds liquid nitrogen from the facility’s bulk tank to the cryostats when needed.